Beuna Vista Home Entertainment has announced the date and released artwork for the animation adventure sequel, The Incredibles 2 starring Holly Hunter, Craig T. Nelson and Samuel L. Jackson. Click on the link below or image to the left to check out the features and artwork. 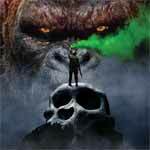 Kong: Skull Island isn’t perfect but still fun and entertaining enough with director Vogt-Roberts intermixing monster movie with a Vietnam-era war picture and even the human characters weren’t bad, if not thinly written at times while Kong himself does show a bit of personality and his CGI was pretty good. Warner Home Video has announced the date and released artwork for the action-adventurer, Kong: Skull Island starring Tom Hiddleston, Samuel L. Jackson, Brie Larson, John C. Reilly and John Goodman and directed by Jordan Vogt-Roberts. Click on the link below or image to the left to check out the features and artwork.